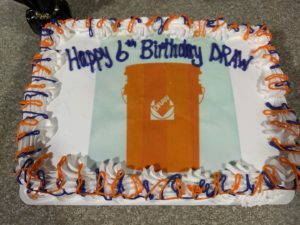 DRAW Turns 6 Because of You! In our six years, we’ve given away over $1 million in supplies to disaster victims, and deployed thousands of volunteers to aid communities. -In 6 years, we’ve responded to 47 natural disasters, nationwide. -In 6 years, we’ve had up to 8k-10k volunteers yearly. -In 6 years, we’ve collected/distributed over $1 million of supplies to disaster victims, including 13,000+ of our buckets. -In 6 years, we’ve provided hands-on, volunteer services to 1,843 homes, all within a week of them being hit by storms. We’ve done all of this while never having more than 1.5 paid staff during any of the 6 years.